Here’s how to use them to create easy peasy main-dish meals that will leave you feeling lightened up and fully satisfied. It's that transition time of year when many of my clients ask for advice on switching up their staple meals. Warmer weather means we're no longer bundling up, and bathing suit season is approaching, so ditching hearty starches like pasta just makes sense. But salads arenât your only option. There are tons of veggies to choose from, and five in particular make perfect pasta stand-ins. Hereâs how to use vegetables to create easy peasy main-dish meals that will leave you feeling lightened up and fully satisfied. Kitchen gadgets that create spiral or noodle-shaped cuts of everything from carrots to cucumbers are all the rage right now. You can pick up a spiralizer or a mandolin slicer at a kitchen store for about $40, or imitate the effect by using a julienne peeler (if you donât already have one in the drawer, theyâre about $10). In addition to providing 35% of your daily vitamin C needs per cup, raw zucchini makes a great base for a chilled âpasta salad.â Add additional veggies, like quartered grape tomatoes and minced red onion, along with a lean protein (like beans, lentils, chicken, or salmon), then toss with balsamic vinaigrette and refrigerate. A perfect make-ahead lunch option! You wonât need any fancy tools to create the angel hair-like strands found inside this cooked squash, a source of blood-pressure regulating, bloat-busting potassium. If you havenât tried spaghetti squash yet, I predict love at first bite, and I promise itâs easy. Just slice lengthwise, remove the seeds, place cut side down on a foil-lined oven tray, and roast at 400 degrees for 30-40 minutes. Once squash is cooled enough to handle, rake the flesh with a fork to release the âspaghetti.â Toss with marinara and top with lean protein, or use as the base for a casserole. 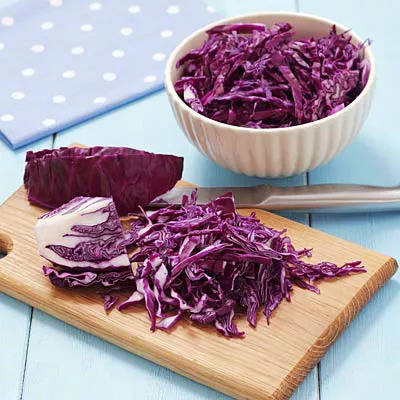 As a member of the cruciferous veggie family (which also includes kale, cauliflower, broccoli, and Brussels sprouts), cabbage is a known cancer fighter and potent heart protector. Most people associate it with slaw, but steamed cabbage is also a terrific pasta substitute. Cover a cup with stewed tomato sauce seasoned with harissa, slather with pesto, or toss with a combo of mushrooms, tomatoes, and onions, sautÃ©ed in extra olive oil with garlic and basil. French beansâwhich are more petite than common green beans with a softer podâare rich in fiber, B vitamins, and immune-supporting vitamins A and C. Steam a large handful and toss with sun-dried tomato or roasted red pepper pesto, and then use them as a bed for lentils or cooked shrimp (this combo is also great chilled), or slice them lengthwise to form skinnier strands and cover with a ladle of thick tomato sauce. Natural substances in eggplant are known to fight aging, protect the brain, and trigger blood vessels to relax, which improves blood flow and boosts circulation. To take advantage of their benefits, grab a vegetable peeler and go to town, slicing the entire eggplant into thin âribbons.â Lightly mist or brush the ribbons with olive oil and roast on a baking sheet. Serve them hot or chilled as a pasta replacement; or top slices with goodies like hummus, roll up and enjoy!